The compiler can generate between 20 and 36 bytes of binary for this section of the kernel. The performance is 1/5th the rate of a native 16-bit floating point add and uses 5 to 9 times the instruction cache of a native instruction. It also requires an extra 2 registers per code block. We use the above code to implement v_addpk_f16 . 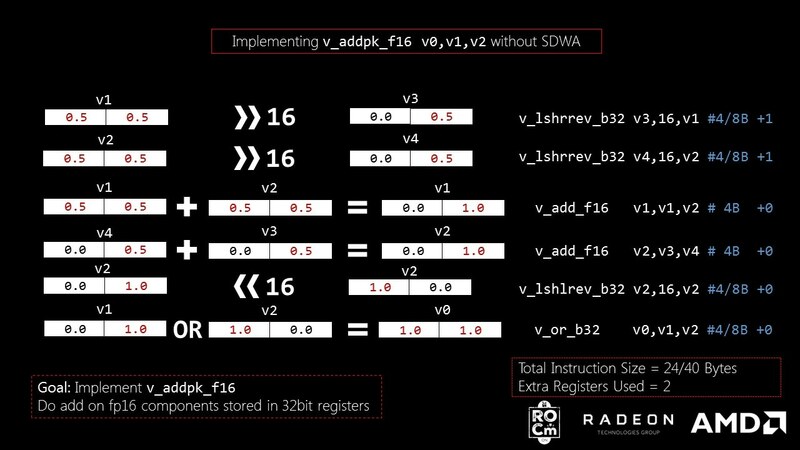 v_addpk_f16 is packed addition on 16-bit floating point data present in a 32-bit register. For example, v_addpk_f16 v0, v1, v2 does v0.x = v1.x + v2.x and v0.y = v1.y + v2.y . The code above shows how v_addpk_f16 can be implemented without SDWA. The code takes up 24 to 40 bytes of kernel binary and 2 extra registers are used. These short-comings can be solved by using Sub-DWord Addressing. Sub-DWord Addressing (SDWA) is another instruction modifier supported from gfx 8 (just like vop_dpp ). 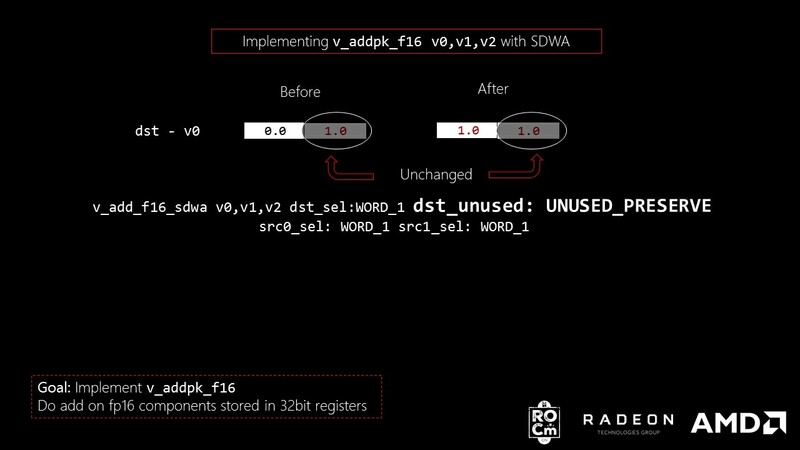 Similar to vop1, vop2 instructions, the SDWA instruction vop_sdwa takes up 32-bits with following format. The bit fields control the addressing mode of the registers. This blog focuses on the 16-bit addressing mode, but different addressing modes are possible. 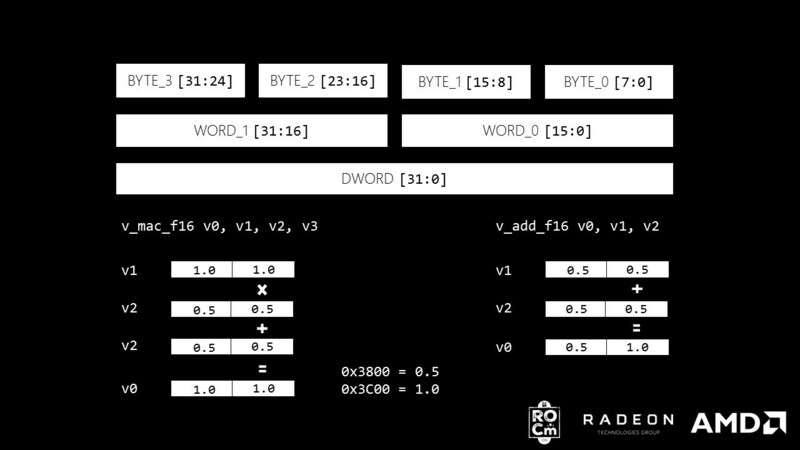 The instruction types that can be used with vop_sdwa are vop1, vop2, vopc , which are 32-bit encoded instructions. Execute the vop_sdwa instruction to enable the desired addressing mode before using the vop1/vop2/vopc instructions. It only allows vector registers for source and destination which means no scalar registers and no immediate literals. The assembler provides a good interface for using SDWA without requiring the user fabricate the ISA (binary). v_add_f16_sdwa mean that we are operating add op on 2 16bit floats in SDWA mode. dst_sel:WORD_1 mean that we are storing the output in [31:16] of v0 (WORD_1, [15:0] means WORD_0). dst_unused:UNUSED_PRESERVE mean that the rest of the bits after storing in output will not be made 0. Which means with the current instruction, [15:0] bits of v0 are left untouched. The size of this instruction is only 64-bit (8bytes) and has 1x the execution rate of v_add_f16 . 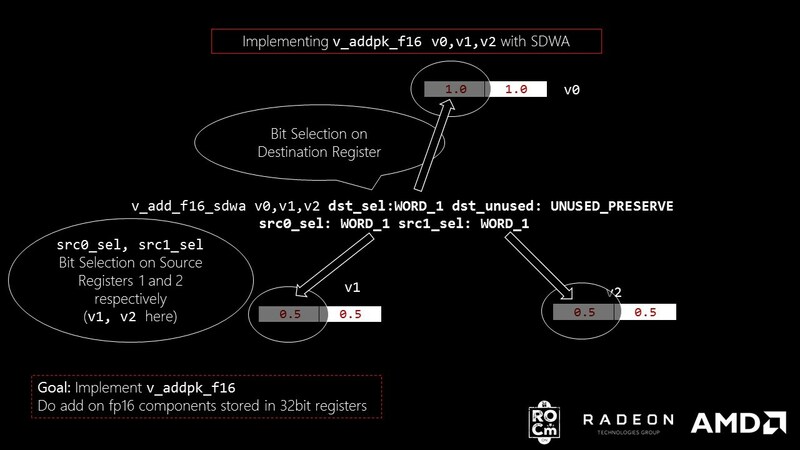 Using SDWA saves instruction cache misses and the ALU can operate at full op rate. No extra registers used, there is no drop in rate and only 4 bytes are added instruction cache. In several Machine Learning algorithms, training the data on fp16 data types has been effective in increasing the execution rate. In some cases the amount of training data is reduced to half and the effective bandwidth is improved by 2. Of greatest interest is optimizing the most used fp16 ops in a kernel, add, mul, mad . 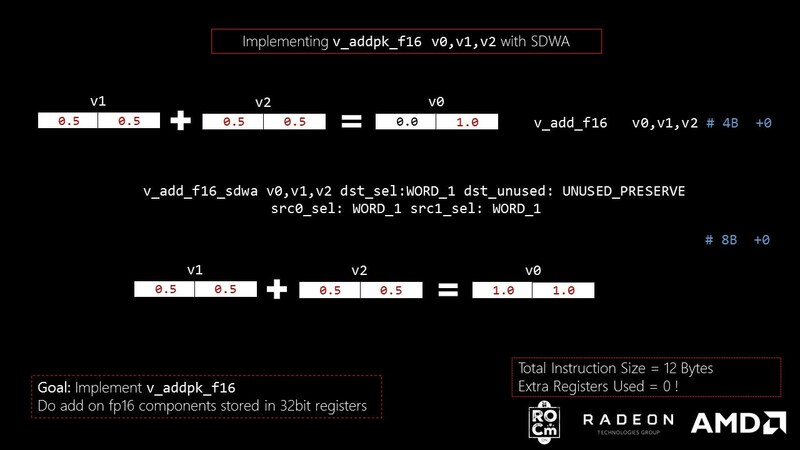 This example shows an implementation of v_addpk_f16 that does a component-wise add on 2 fp16s loaded into a 32-bit register. That’s all it takes and the rate of the instructions does not change, which means you get the same TFLOPs as a v_add_f16 . Also, this piece of code takes 32 + 64 bits on instruction cache (12 bytes). dst_unused:UNUSED_PRESERVE means that the data present in WORD_0 is not touched (hence the word PRESERVE). The next example is an implementation of v_madpk_f16 , and shows the limitations of SDWA. Wait! Why not use v_mad_f16_sdwa ? Because v_mad_f16 is already a 64-bit encoded instruction ( vop3 ); it isn’t one of the instructions that supports Sub-DWord addressing: vopc, vop1, vop2 . In other words, SDWA doesn’t apply here. Eventhough v_mac_f16 is a 32bit encoded instruction (vop2), it only allows DWORD addressing for destination register. Let’s try one more example swapping the results between the most significant part and least significant part of a packed add before storing it in destination register? SDWA operations seem nice, but how do they perform and how do you use them? In HIP, several SDWA math operations are implemented using the techniques described in this blog. A full list can be found here Link. The kernels for performance test were written in LLVM IR. LLVM (which is open source and fully supported by ROCm) was used to compile IR to AMD GCN ISA. Finally, the HIPs Module API loaded the code object and ran the kernel using hipModuleLaunchKernel . The numbers in the above image show that v_addpk_f16 performs same as v_add_f16 on MI-6 and MI-8 using SDWA. The non-SDWA implementation is 0.25x or 0.3x the performance of v_add_f16 . v_madpk_f16 cannot achieve same performance as v_mad_f16 as it cannot operate on most significant 32 bit register using SDWA. Hence only a fraction of v_mad_f16 throughput is achieved. I guess one of the above should refer to v2 instead of v1. I love your blog posts! Could you also write one on the Global Data Share (GDS)? I have been using it on 7990 and RX 480 for a while now, and I have a lot of questions. Thank you! I have plan to test out GDS. I can’t give a date out until I get all the pieces together. The best place to start is to look at amdgpu backend tests in llvm. Why don’t you comment about the questions you have and see if I can answer them. I would also like to know what I should expect from the GDS performance-wise. I am under the impression that it is much slower than the LDS, and I would love to get some concrete numbers in terms for data transfer rates, especially for RX 480. Thank you again, and I look forward to your reply! Thank you for pointers. I am discussing with driver team about how to access GDS, once I get a break through, I’ll let you know. Can you create an issue with detailed description of your needs and questions here: https://github.com/gpu0/amdgpu-code ? It reminds me to work on it. 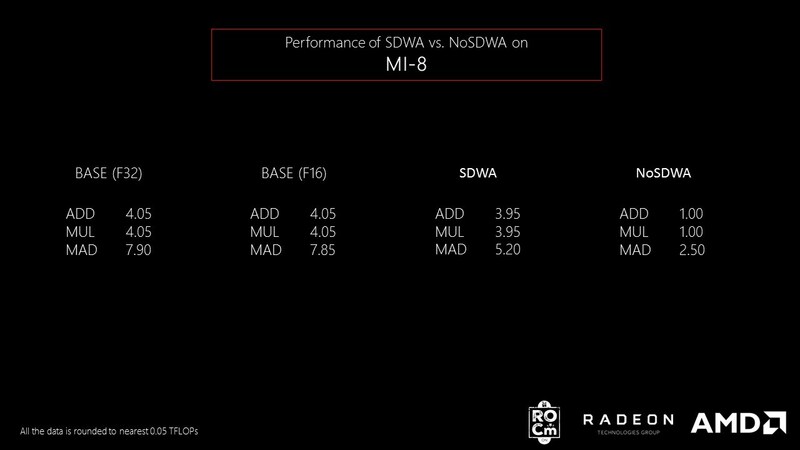 The SDWA performances look very promising, can you publish these tests results for the MI-25 too?